pack animals, including horses and mules, are known to transport pilgrims and goods. Now, these animals serve another important purpose, a study has shown. They help reduce CO2 emissions. This, researchers concluded after studying six major valleys--Kedarnath, Bhyundhar, Pinder, Urgam, Nandparayag, Nizmulla--in the Garhwal Himalaya region. They surveyed 60 villages where the road network is not well developed and transportation is dependent on pack animals. Two years' data of daily distance covered by the animals, number of working days, average and total quantity of load carried in a year was collected. The estimated total load was converted into vehicular units. Since diesel jeeps are common in high altitude areas, all calculations were based on this transporation unit. The average load carried per diesel jeep was fixed at eight quintals as informed by jeep owners. Accordingly, the total number of required vehicle trips were estimated. Based on the total distance covered by vehicles in each valley studied, fuel consumption was calculated taking six km per litre as average mileage. 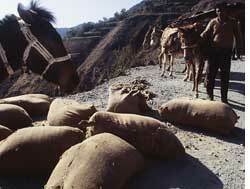 It was found that 221,588 litres of diesel worth Rs 70.9 lakh was saved in the six valleys because of pack animals. The highest fuel saving was in Kedarnath (99,092 litres of diesel worth Rs 31.7 lakh). Researchers estimated the CO2 emissions based on ipcc guidelines and found that the total CO2 emissions savings translated to 481,710 kg. "In the absence of development of technology to reduce greenhouse gas emissions in richer countries and transfer of the same to the poorer ones, it is imperative for developing countries to utilize services of pack animals and oxen drawn cart for transportation of non-perishable goods," says Nehal A Farooquee of the G B Pant Institute of Himalayan Environment and Development, Garhwal Unit, and the lead researcher of the study that was published in Current Science (Vol 95, No 1).